Commercial coating systems are not resistant to moisture, chemical and UV attack. Epoxies, sealers and faux finishes begin to fade and break down within 6-12 months requiring costly repair and reapplication. Contractors must be able to meet and exceed architectural and buyer requirements for quality, durability and aesthetics. Eco-CorFlex Poly Enhance is a versatile architectural flooring system that has extreme durability, chemical and UV resistance. Poly Enhance was created to protect and beautify a myriad of surfaces for interior and exterior applications. Poly Enhance can be applied clear or tinted to rejuvenate and transform worn and weathered concrete, stone and paver surfaces. To enhance visual appeal, PVA, Mica media and Liquid Art coating systems can be used to create visually stunning surfaces and custom finishes. 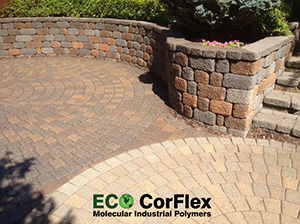 Eco-CorFlex Poly Enhance can be applied to virtually any surface or material such as concrete, paver stones and exposed aggregate. In addition to bonding to the surface, Eco-CorFlex Poly Enhance densifies and strengthens the material it is applied to. Poly Enhance coating systems can restore and renovate damaged surfaces eliminating removal and replacement cost. In addition to beautification, Poly Enhance creates an impervious barrier that will not allow oil, chemicals and other substances to penetrate and stain the substrate. Gum and other unsightly substances are easily removed using an eco-friendly citrus based solvent or other product such as acetone or xylene.